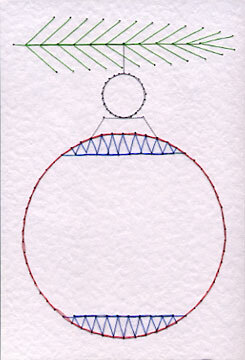 A bauble stitching card pattern has been added to the free patterns section of the Form-A-Lines website. The large bauble has an open area where you can add extra decoration of your choice, such as a greeting or a decoupage image. This bauble pattern is currently being featured in the Form-A-Lines forum gallery card making challenge. Forum membership is required to post pictures. Go to the forum and click the “Join” link to join.